Beginning in the 1930s and 1940s, scholars and musicians discovered a veritable treasure trove of music in the archives of the Moravian Church in America – manuscripts, early printed music, much of it in German. As they explored more, they were awestruck at the quantity of music, and the variety of composers – those known to be Moravian, and those known in wider musical circles. conductor Thor Johnson (son of a Moravian minister), a group of clergy and laypersons in Bethlehem, Pennsylvania, decided to hold an “Early American Moravian Music Festival and Seminar”, in Bethlehem, on June 26-July 2, 1950. The “seminar” included distinguished faculty members Rev. Charles B. Adams (hymnology); Dr. Carlton Sprague Smith, Chief of the Music Division of the New York Public Library, and Dr. Hans T. David, Professor of Musicology at the University of Michigan at Ann Arbor (musicology); Professor Mark Davis, head of the Music Department of Moravian Seminary and College for Women, and Director of Music at Central Moravian Church (organ); Professor Malcolm Johns, Wayne University in Detroit, and Professor James Wolfe, New York City (chorus); and the Rev. Reuben Gross, Pastor of Edgeboro Moravian Church in Bethlehem (dean of seminar). Walter Schrempel was the Festival’s general chairman. 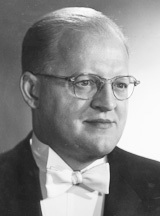 Thor Johnson served as music director and conductor, with Norma Heyde, soprano, and a small chamber orchestra of top-notch professional players, many of whom were colleagues and friends of Dr. Johnson. a chamber music concert on Friday, June 30, featuring John Antes’ String Trio #3 in C Major, J. F. Peter’s String Quintet #6 in E-flat Major, J. S. Bach’s Brandenberg Concerto #5 in D Major, and Four Songs for solo soprano, strings, flute and organ, by G. G. Müller, J. Dencke, S. Peter, and J. Herbst. and a concluding Festival Service at Central Moravian on Sunday afternoon, July 2, including anthems by Peter, Herbst, Peter Wolle; Mozart sonatas for organ and orchestra; organ solos; and congregational hymns. Pre-concert chorales were provided for the Friday, Saturday, and Sunday afternoon performances by members of the Southern Province Moravian Bands under the direction of Austin Burke, and for the Sunday morning service by the Trombone Choir of the Moravian Congregation of Bethlehem under the direction of Mark Davis. Reports are that a good time was had by all … and that plans began almost immediately for a second one!